NW Wind & Solar won the first-ever Eagle of Merit Award given to a subcontractor by the Associated Builders and Contractors of Western Washington for its work on the Bullitt Center in Seattle. The company installed 475 solar modules that cantilever 20 feet beyond the roof’s edge. With safety regulations changing, responsible contractors must have someone making sure safety programs and job sites are up to date. Every element is set up so that clients, designers, consultants and construction teams of all levels of technical expertise can collaborate more effectively. New tools are helping contractors build projects more efficiently and shorten schedules. Going modular? Think of the factory as a big subcontractor A product constructed off-site employs the same building codes, typically uses the same materials and is fully inspected — similar to site built. The Associated Builders and Contractors of Western Washington honored its members’ projects Wednesday night at a banquet at Meydenbauer Center in Bellevue. Rafn Co., winner of last year’s Eagle of Excellence Award, took the top honor again this year for its effort on the First and Vine Apartments project in Seattle’s Belltown neighborhood. Rafn was cited for cost-effective and timely construction techniques combined with an uncommon sensitivity for noise and disruption while renovating a fully occupied apartment building. First and Vine also won the Tenant Improvement/Renovation category. ABC presented a total of eight excellence awards and one merit award. 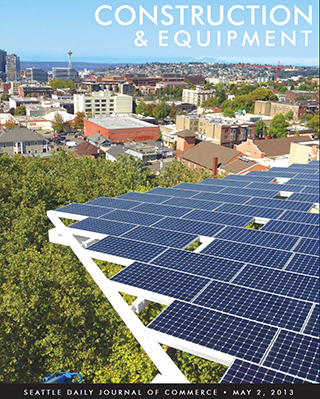 It also handed out an Eagle of Merit Award for the solar array atop the Bullitt Center in Seattle. This year’s judges were Chris Butler of Mithun, Natasha Epstein and James Walker of CollinsWoerman, Scott Rhodes of Rhodes Architecture, John Schaufelberger of the University of Washington, Kate Spitzer of The Miller Hull Partnership, and Benjamin Minnick of the Seattle Daily Journal of Commerce. By combining and comparing ownership and operating costs, managers can establish a total cost of ownership for each vehicle. Seattle’s new safe/sick time law affects companies located outside of the city, if their employees work at least 240 hours per year in the city. A cost audit or review typically saves 1 to 3 percent of total construction costs. Is your insurance broker a claims advocate? Representing the contractor in a claim against the insurance company should be part of the broker’s insurance package. A recent study found that nearly half of family businesses do not have an up-to-date strategic plan, and nearly two-thirds have no succession plan.